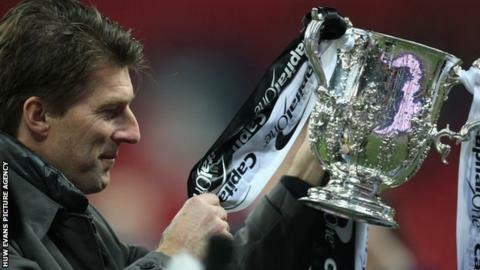 Manager Michael Laudrup has signed a fresh deal that keeps him at Swansea City until June 2015. The Dane guided the Swans to their first major English trophy, a 5-0 Capital One Cup final win over Bradford on 24 February, to reach Europe for the first time since 1991. Laudrup has also seen his side beat Liverpool, Arsenal and Chelsea in his first season in charge. "I am happy here and I never had any doubts I would stay," said Laudrup. "I am delighted to sign the new deal and I'm already really looking forward to next season. "I hope there will be some very exciting things happening with the team and with the club in Europe." Following predictions that Swansea would struggle in their second Premier League season, Laudrup has guided them into eighth in the table. That success helped the ex-Denmark international midfielder to recently win 72% of the votes in a poll among the Real Madrid supporters about who should succeed Jose Mourinho at the Bernabeu. Chairman Huw Jenkins said: "You can never guarantee how things will work out when you employ a new manager, especially after the success we've had in recent seasons. "But I think everyone has seen for themselves that Michael has helped take this football club to another level. "He is a pleasure to work with because he shares the same philosophy as everyone at this football club. "He has ensured that we have progressed again this season and I am convinced his experience and expertise will ensure we keep moving forward for the next few years."